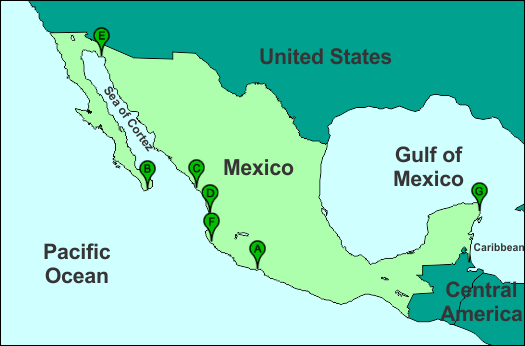 Grupo Vidanta has 7 locations in Mexico. The unit types vary according to location. For instance, there is only a Grand Mayan in Los Cabos, while there is only Mayan Palace in Mazatlan, Puerto Penasco and Puerto Vallarta. Riviera Maya and Nuevo Vallarta have Mayan Palace, Grand Mayan, Grand Bliss and Grand Luxxe. Finally, Acapulco currently (as of August 2012) has only Grand Mayan and Mayan Palace. We didn't mention that a few of the loctions also have a Sea Garden building or a Sea Breeze hotel. You can click on the map pointers or on the titles to go to the location. The link will take you to the most popular unit type and you can change to another unit type once you are there.